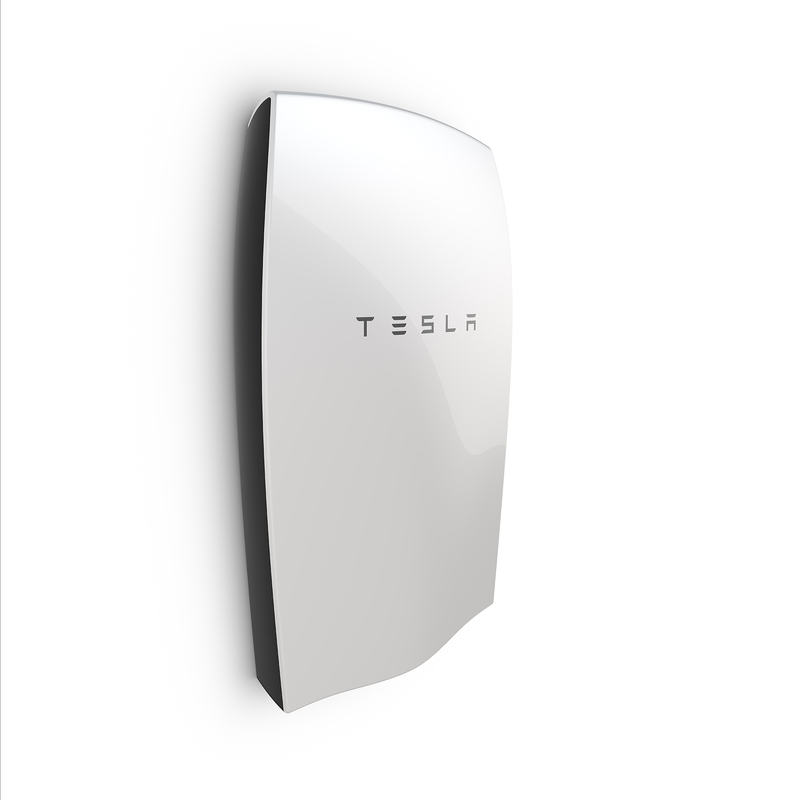 As there is a lot of interest on Tesla’s Powerwall, I thought I’d collate what I could find out about it. 10KWhr for weekly cycle use @ 3500$ to installers. 7KWhr for daily cycle use @ 3000$ to installers. Up to 9 units can be chained together to provide more power. The voltage is curious though – at that sort of voltage, it means you will be connecting to a hybrid grid tie inverter rather than a battery inverter. Most commercial battery inverters run at 24/36/48 (or other higher multiples of 12), so that eliminates using those (if the voltages are correct). The press pages do mention that the Powerwall is supported by the Fronius Symo Hybrid inverter. If we take a look at that, we can see that they only seem to offer a 3 phase solution currently, and that it talks to batteries using Modbus RTU, and at various voltages, depending on capacity. Fronius’s 10.5KWh unit offers 8.4KWh capacity (80% DoD), and connects at between 280-400V @ 16A, so would be the closest offering they have to the Tesla Powerwall. Its also about twice the price! There is other data out there though. This page purports to show details of TESLA’s 10KWhr unit. That unit (if its real) looks a lot more compatible with battery chargers as it runs at a more common 48v. What batteries are they using? Tesla are using NMC (LiNiMnCo) in the 7KW unit. The 10kWh device is designed as back-up, suitable for 60-70 cycles per year. Its chemistry is similar to the Tesla Model S electric vehicle, and is nickel-cobalt-aluminium cathode. The 7kWh system is designed for daily cycling – when homes and businesses will store solar electricity produced during the day. Its daily cycling control constituent is nickel-manganese-cobalt, and Musk expects it to daily cycle for “something on the order” of 15 years. “Actually the warranty period would be a little bit less than that,” Musk said. The 7KW unit is really a 10KW unit, and they’re running it at 70% of actual capacity. Lifetime for NCA is in the 10 year range (3000 cycles +-) @ 70% DoD (depth of discharge) before it drops below 80% of original capacity. Lithium doesn’t like being 100% charged, and it doesn’t like being 100% discharged. Data sheets indicate that Lithium prefers 15-85% for longer lifetimes, so thats the “sweet spot”. It might be that the 7KW unit is only 7KW storage though, which means actual capacity is really 70% of that or just under 5KW (4.9KWhr usable). I personally think that its going to be option 2, sadly. Lithium and other battery lifetime is extended dramatically if you keep it cool. Why is it a game changer? Pricing is about half of current retail battery units. …but Lead Acid is cheaper! Lead Acid provides about 30% usable capacity for a battery. Lithium provides about 70% usable capacity for a battery. Lead Acid will take up far more space. 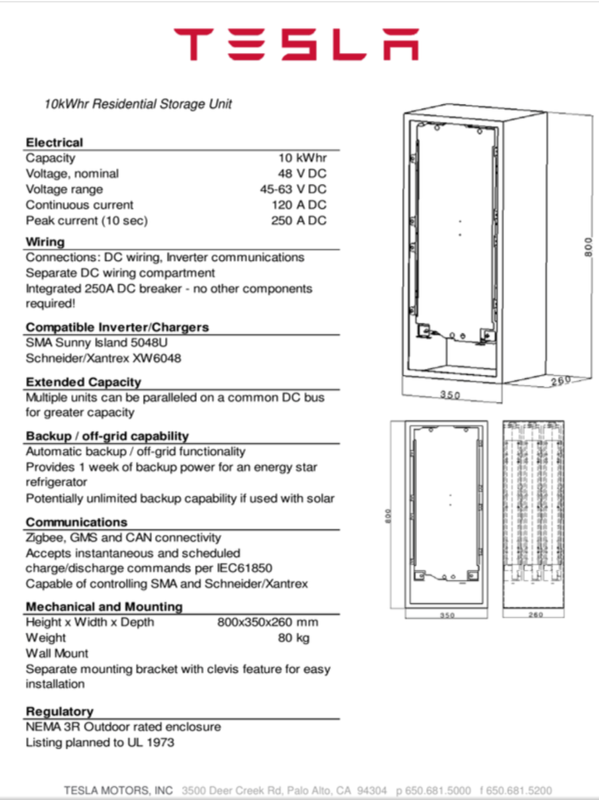 Whats the difference between the 10KW unit and the 7KW unit? Other than the sizing / cycle usage, we don’t know (yet). 10KW unit is rated for weekly cycle, so would probably be for UPS style usage – eg to assist with grid outages like Eskom’s regular ones. Given Eskom’s reliability though, the 7KW unit may be more applicable here! 7KW unit is rated for daily cycle, so would probably lend itself to off grid, or time shifting, or if power outages get to be regular day to day outages here; ideal for that. South Africa doesn’t currently have time of day rates for residential end users, although thats coming at some point, so time shifting isn’t useful here (yet). If the 10KW unit is rated for weekly discharge @ 10 years (3650 / 7), thats gives you roughly 500 cycles. 500 cycles for NCA batteries @ 100% DoD is the rough lifetime, so it looks likely that 10KW is actually 10KW. If the 7KW unit is rated for daily discharge @ 10 years, thats 3650 odd cycles. 70% DoD for NCA batteries gives about 3500 cycles before it hits 80% of original total capacity, so would indicate that the 7KW unit probably is going to be 4.9KW usable, as that also matches with the lifetime / usage. So, my guess is that the 7KW is going to turn out to be 4.9KW usable out of 7KW actual storage. What do I need to use a Powerwall? At a best guess, it looks like its intended to be used with a hybrid inverter. A hybrid inverter is a grid tied inverter with battery charging capability that can create a “mini house grid” if Eskom goes off. So far Tesla says it works with the Fronius Symo Hybrid inverter. Assuming that there really are a number of different units, it looks like they may offer a 48V version for those with existing MPPT chargers (as per the graphic up above somewhere). IEC 61850 is the european favoured smart grid standard, DNP3 is the american standard. Support for those is more likely to be in place for Tesla’s larger units eg the 100MW and up options. Whats the price likely to be in South Africa? If one counts in duties, clearance, shipping it will probably be in the 5000$ range or R60,000 for the 7KW. I’ll try to keep this post updated when more info comes out. This entry was posted in Solar Battery Backup and tagged powerwall, telsa on May 3, 2015 by lawrence.